Research Team "Biologie de la mangrove"
The team "Biologie de la Mangrove" is part of Research Unit UMR 7205 MNHN-CNRS-Sorbonne université-UA "Institut de Systématique, Evolution, Biodiversité" managed by Philippe Grandcolas (organigram of UMR). Our group represents one of the seven teams composing the UMR which is distributed through 2 sites: Paris and Guadeloupe. 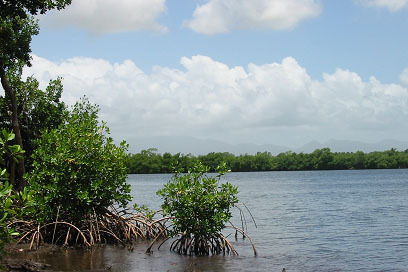 The team " Biologie de la Mangrove " is only composed by people from the University of the French West Indies (UAG) and it is located in Guadeloupe (campus de Fouillole). We have integrated the UMR 7205 ISYEB in January 2019. We study the biology and evolutive adaptations (essentially by the means of the symbiosis) of tropical shallow water models living in extreme environments (such as high level of sulfides found in mangrove swamp and/or in seagrass beds). These environments are easily accessible. To date, we are working on 2 main research topics.